Today we’re showcasing a lovely dessert table that just screams summer! It’s cheery, bright and makes me smile with its vibrant, lemon yellow details. This brilliant display, featuring an amazing cake and cupcake stand by Jan Kish, was created for a wedding filled with burlap, succulents and personality. Yellow Billy Balls with their long, spindly stems add such a dramatic touch to both the centerpieces and the cake. With images like these, I think we can all agree that Love is Sweet! 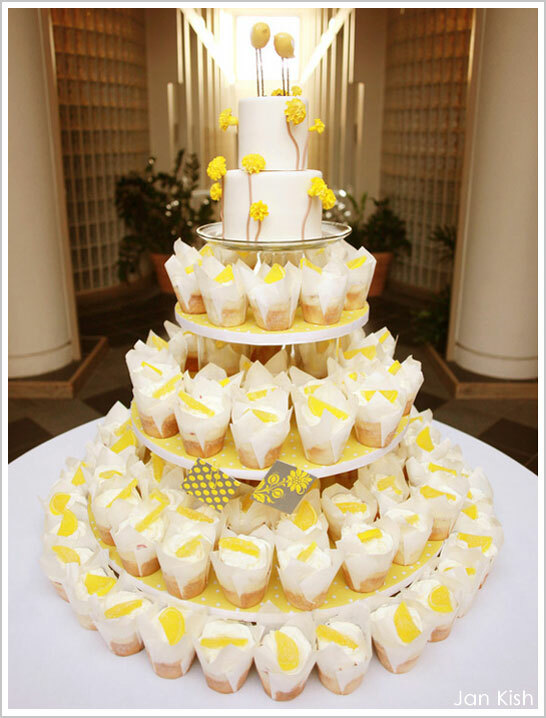 I love these adorable cupcakes topped with candied lemon slices! And the yellow polka dot stand adds a nice pop of color to the presentation. Oh my! This cake is so precious with its Billy Balls and delicate birds on top. It’s a perfect combination of simple sophistication and whimsy! We love this entire display! If you’re loving this as well, be sure to hop on over to 100 Layer Cake to see the entire wedding. Talk about a charming event! So fun – love the lemon wedges! This is like a ray of sunshine! Love it! What a SWEET event! I love all the details and the cake and cupcakes are gorgeous! The yellow is such a vibrant color and really makes this party seem fresh! 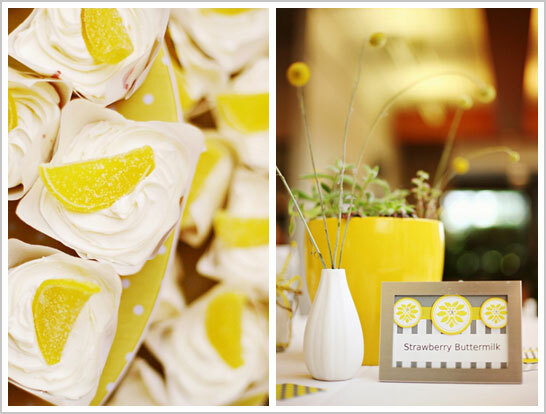 I love all of the yellow accents and yellow desserts! So bright and cheery, and adorable too!